That's a new planeswalker in the picture of a four issue mini-series. Read the official press release at IDW's website. Tentatively scheduled for a December 2011 release. Get ready, Magic: The Gathering fans, there’s a new Planeswalker in town! 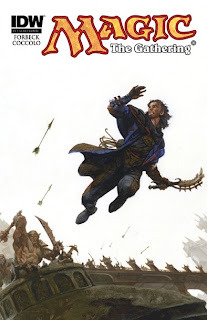 In search of greater magical knowledge and on the hunt for the people who destroyed his town, Dack Fayden is the greatest thief in the Multiverse. When he gets his hands on his latest prize, though, he has no idea where it will lead him—or to who! 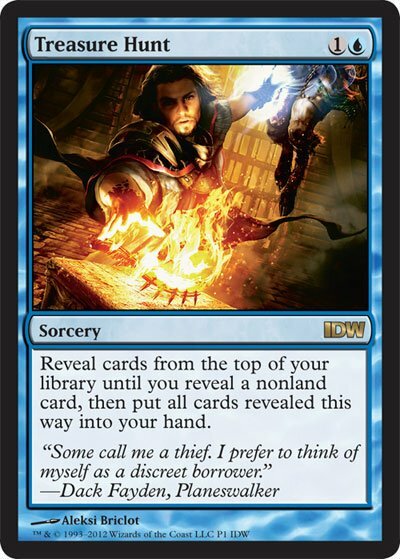 • Includes an exclusive, playable alternate-art Magic: The Gathering card! • Ask your retailer how to get the rare Eric Deschamps variant cover! • Ask your retailer how to get the super-rare Christopher Moeller (JLA: League of One, Lucifer) cover! • Written by renowned author and game designer Matt Forbeck (The Lord of the Rings Roleplaying Game, Amortals, The Marvel Encyclopedia)! The promo card is an alternate art Treasure Hunt . News reported on the Magic: The Gathering Facebook page. What’s the Magic: The Gathering comic about? 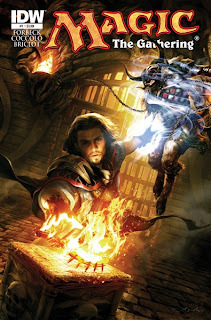 It follows the adventures of a new Planeswalker by the name Dack Fayden. 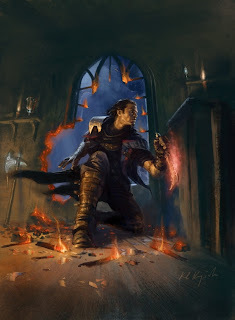 Dack’s not just a powerful mage but also one of the greatest thieves of his age. Unlike other thieves, though, he steals — he’d prefer to say “borrows” — not for money but knowledge. Dack has a special power called psychometry. This allows him to pry into an artifact, figure out how it works, and teach himself the spells it uses. It also gives him visions of the most intense times the object has been used, which can be both horrifying and enlightening. Well, Planeswalkers move between worlds at will, and the comic reflects that. Dack often needs to stay a step or three ahead of the law or whoever else he’s annoyed, so he moves around a lot. He stays until he’s worn out his welcome — sometimes past that. Dack’s current home base is an urban plane called Ravnica. 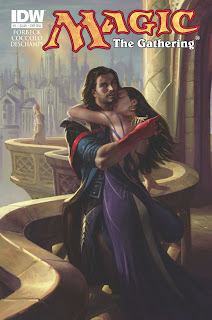 However, the action in the story leaps over to Innistrad fairly fast. Innistrad is the new plane that was introduced with the current block of cards for the Magic: The Gathering collectible card game, on which the comic is based. It’s a place of gothic horror filled with vampires, werewolves, and loads of other monsters. It’s also the place where someone Dack’s been hunting for a long time has been holed up for a while. She’s another new Planeswalker by the name of Sifa Grent, and as we find out in issue #1, she’s responsible for the destruction of Dack’s entire hometown. When does the first issue come out? It should be on shelves and e-readers this December. There are four issues in the first story arc, and these come out monthly. The first issue comes bagged with a previously published Magic: The Gathering card that features the stunning artwork you can see on the covers of the comic. Of course, the interior art is just as amazing. Martín Cóccolo has a fantastic sense of fun and adventure that’s only matched by his skills as an artist. It just shines through on every page. How does the comic book fit with the card game? I'm working closely with the team at Wizards of the Coast who come up with the ongoing storyline for Magic: The Gathering, particularly Brady Dommermuth. No one knows the Magic multiverse better than he, and it's been a blast bouncing ideas off him and seeing what works and what doesn't. I've followed Magic for a long time, but there's just so much great lore to know. Besides that, the team there has drawn back the curtain for me and shown me what's coming down the pike for the game, and I'm working that into the comic storyline too. You can see that by the way it'll weave elements of the new Innistrad block straight into the plot in which Dack becomes embroiled. This means that the material you read in the comic has been vetted, approved, and sanctioned to be part of the Magic: The Gathering canon.